Ever since the gastro revolution, food renaissance, or whatever you want to call it occurred in Budapest, it’s become relatively difficult to share something truly new regarding food, especially when it comes to new hamburger joints opening in the city. We could write about some new place opening seemingly every day. We’re not complaining, since the new places opening today offer the same quality you would have expected to find in the lower end of the premium category five years ago. Of course, ever since we’ve been shown how to make a good burger, we’ve been making them quite well. To be noticed and stand out from the crowd, however, you have to do something big. And that’s exactly what the Marha Bamba Burger is trying to do, but more about that later. It’s got a great location right by the Oktogon, almost a stone’s throw from the Burger King, from where it seems to be giving the finger to the international burger chain. The interior is somewhat enticing, but features too many warm colors that makes it far from the ideal location from which to post your lunch to Instagram. What’s always a good sign, however, is that the burgers are cooked in front of you, the buns are homemade, the beef patties are 140g (1/3 pound) of chuck and suet, and all of them contain special sauces, which we always like. 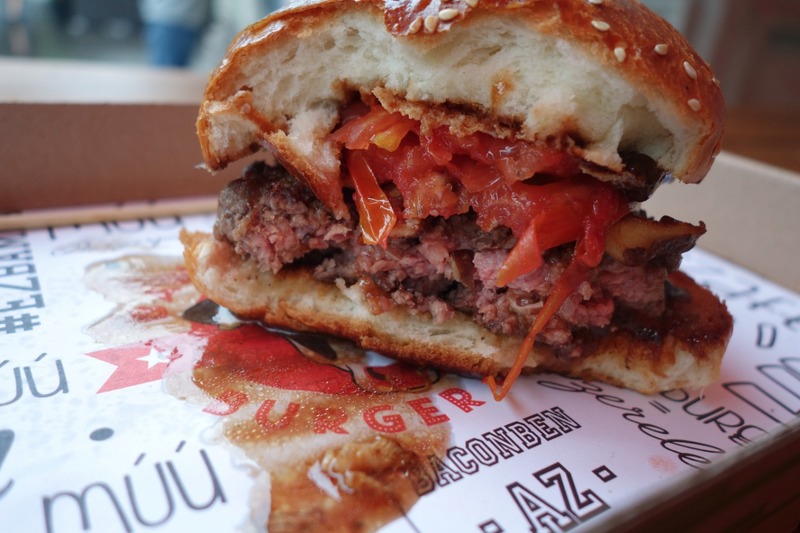 Naturally, we sampled the burger that gives the place its name, and concluded that Bamba Marha Burger really is a fine addition to the other places that have opened across Budapest. But what makes Bamba Marha special? It focused on umami. Umami is the fifth flavor, which is not sweet, salty, sour or bitter, but is rather a “pleasant savory taste”. Foods that contain high levels of it are fish, cured meats, mushrooms, tomatoes, as well as cheeses, soy sauce, and for you Aussies and Brits, Vegemite and Marmite respectively. It’s also famously found in breast milk. 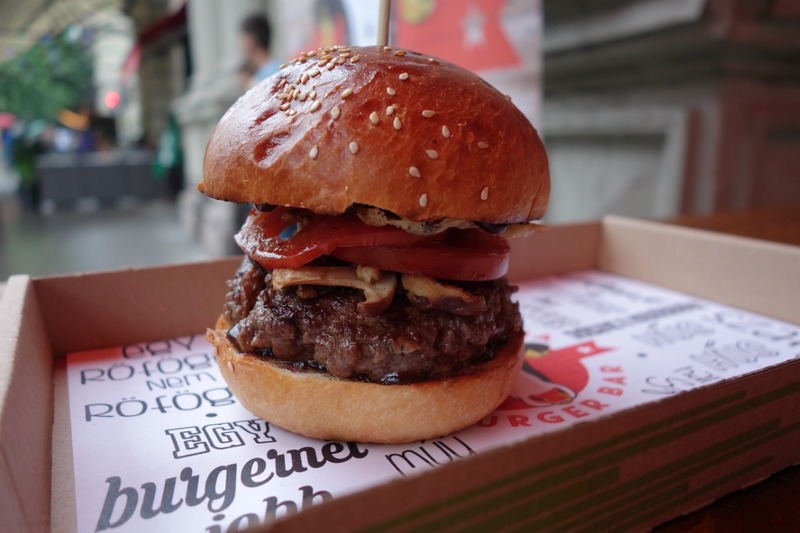 And Bamba Marha did not leave anything to chance, since their flagship burger contains – you guessed it – beef, tomatoes, mushrooms and parmesan (but no breast milk). I swear you can taste something extra, just like when I visited Nobu years ago (in Hungarian). In other words, it’s 97% placebo and 3% reality, but there is definitely something there. And the burger is absolutely great. I really liked the bun; it’s not dry or too soft. The meat was well cooked and the idea behind it is quite exciting. The only shortcoming was that the salt appeared to be in the parmesan, meaning that the cheesy parts of the burger were very salty, while the non-cheesy bits barely had any salt. And with this, Bamba Marha can be considered among the best places in Budapest to grab a burger. The only potential problem could be their prices. This burger cost 1800 or 1900 forints, I can’t recall for certain. The small difference is not what matters, but it is quite a lot. You’ll get the Guitar Hero burger for the same price nearby at Zing, and that thing’s massive with two patties. Even if they don’t contain umami, the foods prepared by Ádám Susánszky – who launched Budapest’s burger culture – are so good that they remain a benchmark to this day. Bamba Marha is a great and exciting alternative, but I wouldn’t call it cheap. And then let’s discuss why the place is special: the recipes were assembled by János Jancsa, the author of the Burgerblog, and if we recall correctly, he’s one of the owners as well. We didn’t accept a discount, or rather paid it back double as a tip. What is it like to arrive at Keleti Train Station as a stranger? It was roughly a year ago that Hamu és Gyémánt magazine asked me to prepare a series of interviews with foreigners living in Budapest who have excelled in some area of the arts. I really enjoyed the project, since I got to meet 20-30 people who saw Budapest as their destination and finally got to spread their wings. Of course, the ratio wasn’t the most perfect, since four times as many Hungarians were moving away on a daily basis. Nonetheless, the thought filled me with joy that while our people were going abroad to try their luck, here were people who had come to Hungary to try theirs. Written on the painting is 1991. Nov. 7. Budapest Keleti. p.u. That was when he disembarked at Keleti Train Station from platform 9 with his suitcase in hand. Yes, the same Keleti Train Station that has been in the international news recently owing to the ongoing refugee/migrant crisis. Fukui travelled from Japan all the way here to Budapest, because he found a copy of Jenő Barcsay’s book Művészeti Anatómia (Artistic Anatomy). That was when he realized he wanted to study artistic anatomy, which is not taught widely around the world. Many of our English readers can probably relate to how it felt to be thousands of kilometers away from their friends and family in a country with a culture different from their own (depending on where they came from), and to then find themselves in post-communist Hungary right after the system change. The differences with Western Europe were much more striking back then than today. Imagine what it must have been like to arrive then, not knowing anyone or speaking the language? As you get off the train, with your luggage in your hand, all you can think of is: ok, let’s go. In all honesty, I don’t know what Fukui Yusuke was thinking at that moment. The reserved nature of the Japanese meant I was unable to break into his personal space. Other than the fact that he spent that night in 1991 in a hostel, and that he got to know a few locals in the bar below the hostel, I couldn’t get much out of him. But the painting that allegedly tells the story is now here. 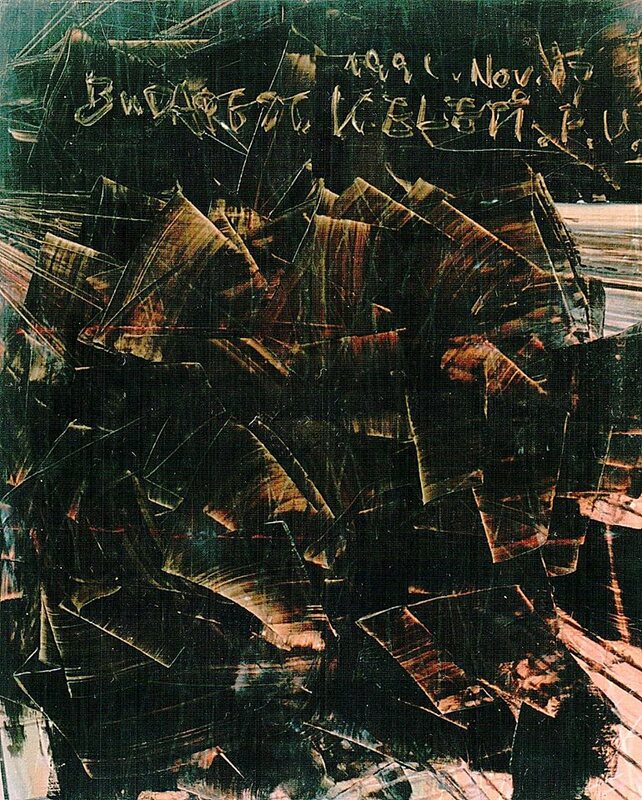 For those interested in an exhibition featuring the works of a Japanese painter who resides in Budapest and how he sees the world, well, you should go check it out. 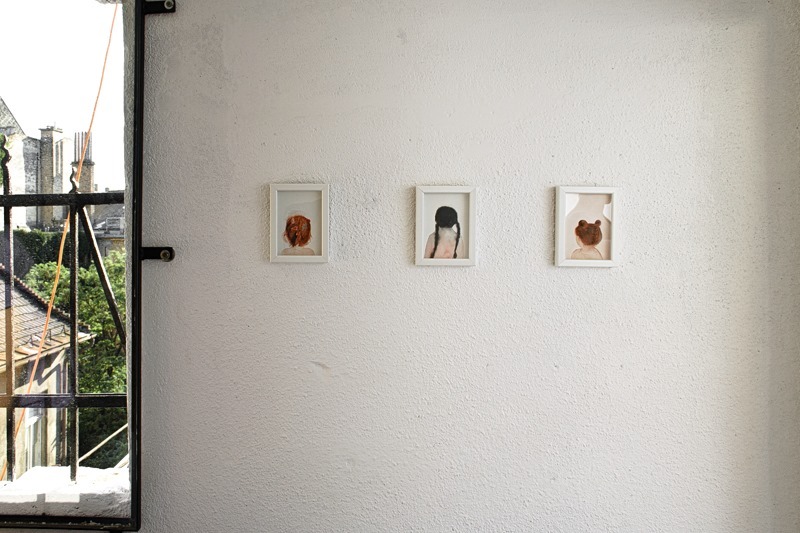 Fukui Yusuke’s – “Worlds on Canvas” exhibition opened on August 29 at the Everybody Needs Art Viewing Space. The event’s Facebook page can be found here with more information. As recently as a few years ago, the differences between the two cities were quite striking. Following the system change, Prague was fitted with attractive stone sidewalks seemingly overnight, making the downtown area so impressive that millions of Western tourists suddenly found themselves wandering between its buildings in wonder. By contrast, Budapest was a slowly meandering stream. Just five or six years ago, the downtown area barely had any renovated areas, and those that had been given a sprucing up were held up like shining beacons, such as Ráday Street and Liszt Ferenc Square. Conversely, we also did our best to hide those that hadn’t wound up quite how we’d have liked, such as the terribly overhauled Király Street, which received such awful decorative stones that there is a certain joy to be found in their destruction through everyday wear and tear. 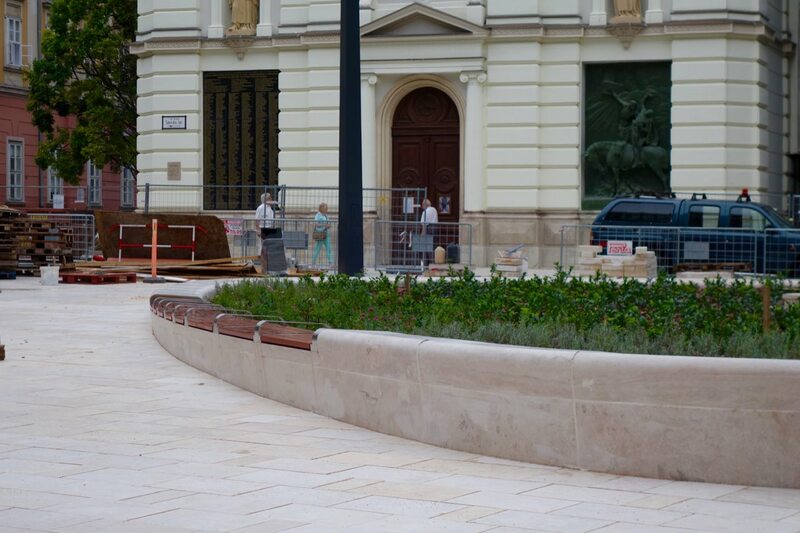 And then, around 2010, the new Main Street was completed with actual stones that gave it an elegant appearance, and even though there are still screw ups now and then such as Váci Street with its embarrassing stonework, on the whole, the downtown area is finally starting to have some kind of coherent common appearance. And that's a good thing. 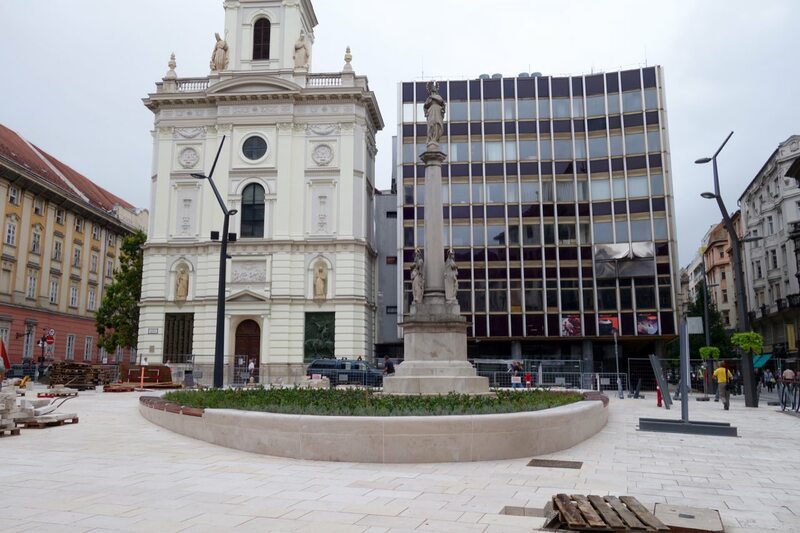 The new Main Street, March 15th Square, the side streets and Kálvin Square have all been fitted with modern but elegant elements (street lights, bike racks and trash receptacles) and now even Szervita Square is receiving a face-lift, which will soon be completed. I'm not saying that this will be the most inspired part of downtown, but it will finally fit with downtown’s new image, which fortunately took its inspiration from the best parts of the renovation works, instead of the disaster zone that is Király Street. But still cooler nonetheless. We shouldn’t go into overdrive with these developments though, otherwise we might end up starting to resemble Vienna or Zurich, God forbid. Fortunately, however, there's enough rawness and chaos around downtown that it is far from looking like a sterile shop window. 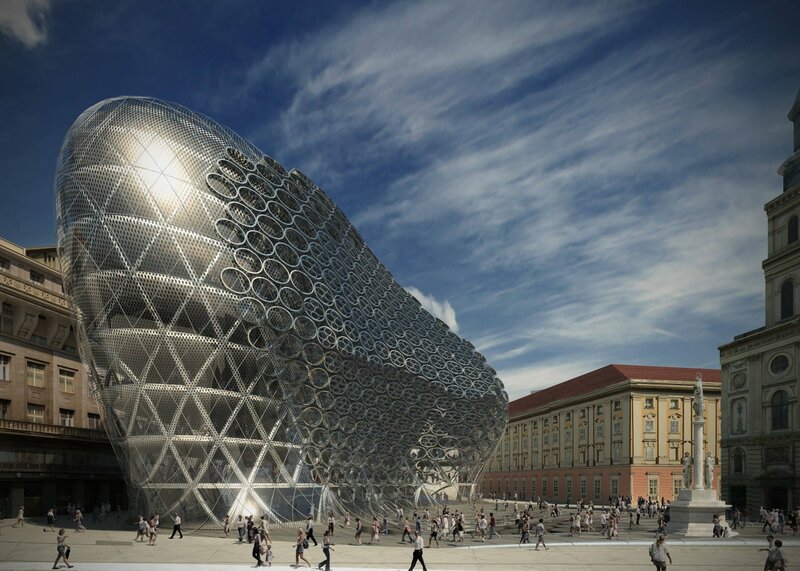 Here’s the newest in our series on Rákoczi Square. In the past, it had one of the worst reputations in the city, but these days it’s being rediscovered as a place where new and old architecture stand side-by-side in harmony. Rákóczi Square contains everything that makes District VIII (Józsefváros or “Josephtown”) exciting: all sorts share the seats that surround the reflecting pool, but you can find similarities between the people gathered here. In addition to the elderly playing their card games, the moms pushing strollers and the college student reading a book, you can also find faces twisted by their hard lives, not to mention the occasionally bizarre characters that still find their way here. All you need to do is find a seat, sit back, and watch. In the first section, we discussed reader’s choice Rákóczi Taverna, and then later dropped in on Csiga, a place that could not be better located for the type of place it is. Then, last week, we visited the new, impressively designed and somewhat futuristic wine bar Oinos, where the kitchen leaves something to be desired. This time, we’ll check out the jewel in the crown of the square: Budapest’s Market Hall No. 2. Budapest’s market hall fever took off in 1896 with the construction of the Great Market Hall on Vámház Körút. Before that, traders and produce sellers sold their wares at various smaller markets. The new system allowed for centralization and maximization of prices, and the tight, even claustrophobic stalls that were fed with products arriving via various methods, including rail, ensured that Budapest’s hungry city dwellers could be provided with a high turnover of goods. This was the second market to be built, between 1894 and 1896. A year later in 1897, other markets opened, such as those at Hold Street, Hunyadi Square and Klauzál Square. This new way of shopping soon became the norm. We have a fire to thank for the fact that Market Hall No. 2 is in such good shape. The building was gutted in 1988 and completely rebuilt before reopening in 1991. Once inside, you’ll find yourself standing across from butchers and produce sellers, with one of the latter selling particularly nice products by the side entrance. This is where we’ll find Rezső Hortig, a dairy farmer from Lajosmizse, selling his cheeses and yoghurts. He sells fresh cow’s milk for 220 forints per liter. “Consumable after boiling,” the sign reads. I sampled the cheeses, which are the typical kind that belong to the widely available “homemade Hungarian cheese” category. The goat’s cheese was quite pleasant, with the smoked garlic cheese a bit too powerful. I couldn’t exactly taste the part that had come from the cow. There is a fish stall with the name Aqua Shop, which has a wide selection, where you can find salmon, butterfish, red tuna and squid alongside Zander, trout and carp varieties. They don’t have huge quantities, just enough to sell. And there’s also the Wine Fountain, a magical place where you can tap wine directly from the wall. Bring your own bottle and they’ll fill it. If you don’t, you can buy a PET bottle in 2L or 5L sizes. The chardonnay and kékfrankos are 349/l, with the semi-sweet rosé and white wines running the same. The cabernet sauvignon and the secretive “sweet red” are a bit more expensive at 499/l. I took some dry rosé home with me and a cabernet sauvignon that won an award at the Kunság Wine Competition. The first one surprised me with its vibrant red color, and “red wine lite” aroma, while the latter did the same with its unripe blend of cabernet flavors. Which is what I expected. For these prices, they were entirely drinkable, if not exactly good. They originate from the Tápió-Vin winery in Pest County. There’s also a book exchange point by one of the stores on the side, where if you bring a book you can take another from the shelf. Obviously the books are not the most current. You can find all of the Dallas books, or the picture book A Gépek Forradalma by Jenő Randé, and another book published in the 1970s about anti-communism. Unfortunately, you won’t find a good baker. There’s a Fornetti and a Lipóti, with the only enticing bread to be found at Pék Pont, for 900 forints per kilo under the name of Aristano bread. I looked through the sausage varieties ranging from horse to mangalica, and asked for samples at two places from the best looking examples. I asked for paprika pork crackling, without the skin, for 1950 forints, as well as mangalica bacon and not-so-special bacon. All of them were fine, but none stood out. Unfortunately, the market only hits a middling to high level of quality, but at least all of this is in a friendly and airy environment. The side of the building also contains an Asian foods store, where you can purchase Eastern ingredients and spices, complete with a “Keep Calm, we’re Open Sunday” sign. Aside from that, everything has an old Josephtown vibe, just a bit cleaner. Address: 1084 Budapest, Rákóczi tér 7.
bake bread that makes you proud. The competition featured professional bakers and home-cooked breads alike. For more on the ideas and rules, see my earlier post in Hungarian. This time, I'll primarily share pictures on how the whole event went down. Margitutcakilenc proved to be a wonderful host for the event. 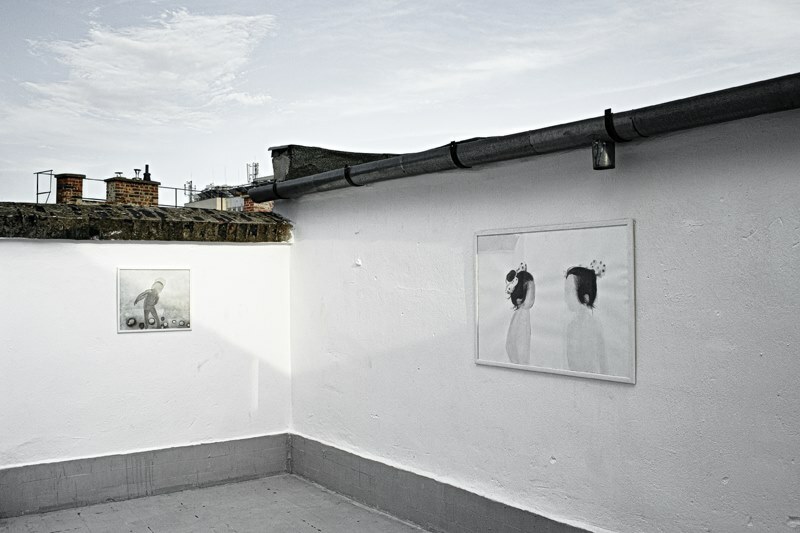 It was airy, had ample space and the location gave the event a village market atmosphere. The organizer went around distributing his croissants. 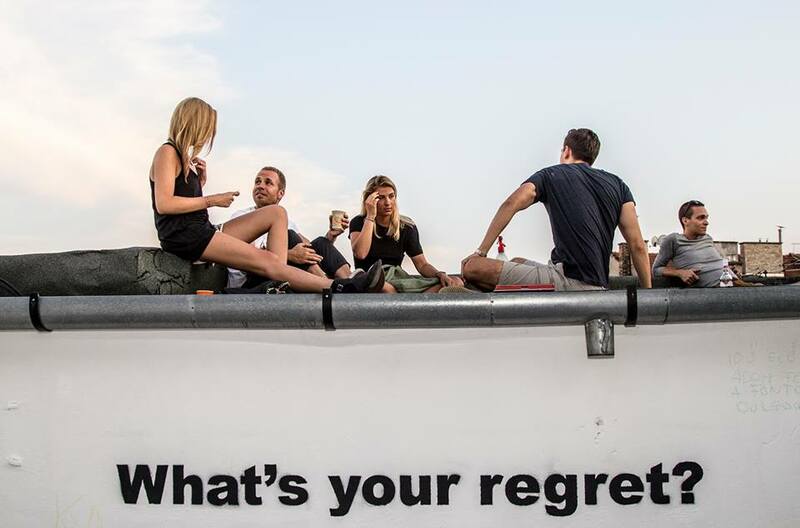 And what was characteristic of the whole event was that no one asked for any money for their products: there was no registration fee, and the location and musicians performed for free. Tilla, MC’d the event without asking for a dime, while the coffees provided by Casino Mocca and the wines poured by Bortársaság were all provided at no cost. The sitar’s sound provided a unique atmosphere, with the crumbling plaster walls offering a delightful visual backdrop. The food prepared by Margitutcakilenc was so amazing that we fell off our seats. Offcuts of meat with onion marrow and similar things. It was a fantastic way to follow the third kilo of bread. A rustic idyll in Buda. They managed to assemble quite a serious jury. It contained professionals, such as Tamás B. Molnár, who was immediately elected jury president, and Frigyes Vomberg from the Bocuse d’Or Academy, as well as professional chefs Viktor “Vili” Varju, Ákos Sárközi and Krisztián Huszár, Anikó Kurunczi from Bortársaság and of course the bloggers: Mária Libor from Limara Péksége, András Jókuti from Világevő, Csaba Bíró from Boldog Briós, and myself representing Egy Nap a Városban (this blog’s Hungarian name). And we smelled and sampled. Points were awarded according to appearance, crust, crumb, aroma and flavor. Owing to the large number of entries, the jury will only judge the professionals in the future, with the amateurs being judged by the bakeries. The public was allowed to sample the breads once the jury was finished with them. Conducting an interview with Józsi is a rather simple feat, since you don't have to wait long for him to say something quotable. The winners in the amateur white/semi-wheat category. We encouraged them to open bakeries, since it would mean three new places worth shopping at in Budapest. It's a guaranteed business proposition as there is plenty of surplus demand for high-quality bread in this city. I've never before seen so many exciting breads as I did at the Soul of Bread competition. It was fantastic to see and taste and finally not have to sample mass-produced products, which have their low-quality unsuccessfully disguised by various dubious means. All breads prepared for the event were baked the way you’re supposed to: with attentiveness, thoughtfulness, or, as Józsi likes to say, with love.